As the headlines on all (non News International) media outlets drive public anger over the Millie Dowler / News of the World phone hacking scandal, social media reaction looked at targeting advertisers who work with the paper. Several sites have given easy to use lists of recent News of the World advertisers to enable the Twitter community to contact them and ask them to withdraw their advertising – as summarised by The Wall. But are these brands listening? Are they aware of the maelstrom being created on the NOTW hashtag? And are they utilising social media to respond to heavy, critical, online traffic against their brands. At best this shows these brands are simply failing to listen to social media properly. As a marketing failure, it also shows they are unable to join up the news agenda and social media with advertising. At worst it shows they simply don’t care. Or, even more cynically, they are waiting to see if the crisis results in a potential drop in the NotW’s circulation this Sunday, before making a decision on if they should continue to advertise with the paper. UPDATE, 4pm: Channel 4 are reporting nPower and a ‘major car manufacturer‘ are considering pulling their adverts. 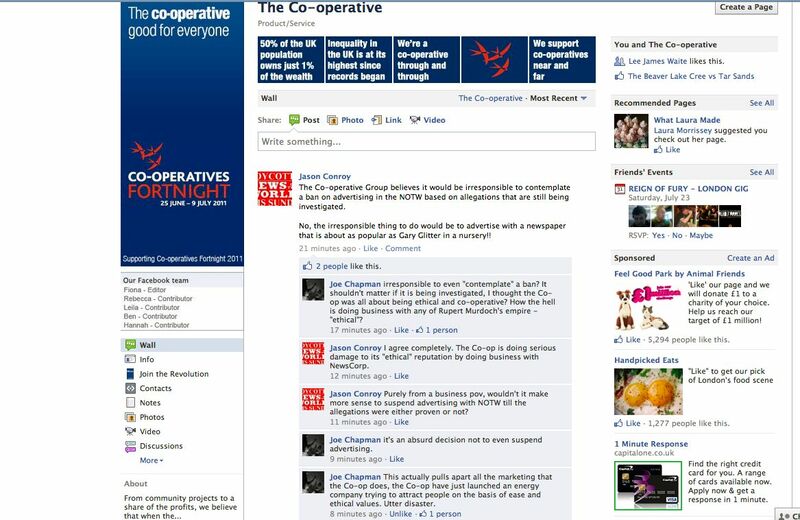 While Co-Op are defending their ‘keep advertising’ position on Facebook. UPDATE, 5pm: Body Shop go on record to say they don’t and don’t plan to run any advertising with NotW on Twitter and Facebook. A host of other brands are ‘playing a waiting game‘ to see if the crisis will have a significant reputational damage to their brand or to the NotW’s circulation. PRs rushing to point out that the first who actually withdraws advertising will score big on media coverage. Ford is a company which cares about the standards of behaviour of its own people and those it deals with externally. Meanwhile, Halifax are added to the growing list of advertisers ‘considering their position‘. As I said in response to Mark Sweney at the Guardian, no one will want to be the last brand (which actually cares about its reputation) left standing. In today’s media climate, those who act fast get the biggest returns. Over at the Co-operative, things are turning nasty on Facebook as customers start to question its ethical stance of doing business with News International. There’s an example, right. UPDATE, 8pm: As Tesco and Virgin Media confirm they will stand by the News of the World while the investigation continues, the biggest loser in social media terms would appear to be the Co-operative. It has built a loyal following thanks to its ethical stance on issues ranging from investments to anti-tar sands through to treatment of animals. But this legacy is being undermined by their silence in social media. Come on Co-op – you’re the one corporate brand I have any trust in. Don’t let me down, withdraw your ads from all News intl publications. You’ve got an advert on this very page saying “good for everyone”. And then you also advertise in the NOTW after these latest criminal acts, among many already admitted to? Are you trying to lose my custom? As customers get even angrier on Twitter and Facebook, it now seems that the Co-op may only have one choice: pull their ads or risk a mass erosion of their brand values in the public eye. The disappointing truth is that all these problems could have been avoided by listening to social media and been open with people earlier. ← Would you help out the BNP?